Last month we talked a little about the science of persistence, what it takes to make your persistence, well, persist. It turns out there is much research into what makes us persistent, to exhibit true grit, so we can use this knowledge to improve our likelihood of staying the course, even in the face of adversity. In my quest to examine the nature of persistence in the gritty real world, I did what I always do: I turned to my zen master gurus kids. If I am to be completely honest, my kids so far haven’t exhibited much in the way of sporting accomplishment (sorry kids, but you probably won’t be going to the Olympics any time soon, unless Minecrafting and making Glitzy Globes is admitted), but when they set their minds to it, they are able to surprise me. This is the story of Coco and the Cartwheel… Getting gritty in the garden. With absolutely no desire to hurtle through the grass upside-down, I asked her why she was willing to risk breaking bones and vases for something, (let’s be honest here) is essentially useless. “I love the idea of it. I love that I can’t do it yet, but I know that I will one day, and then all of us girls at school can cartwheel all around the oval,” she said, hopping from one foot to another, popping to get back to her training. Then she stopped, “I know Mum, why don’t you video me with that slo-mo thing on your phone, so I can see what I’m doing?” I smiled inwardly, knowing what I knew about the science of grit: interest, deliberate practice, purpose, hope and belonging. Or in in8 model terms: Why, What, How, Who with, and When? She had it all. Oh my. Give me strength. Or grit*. *If by grit you mean a glass of wine and a nice lie down. 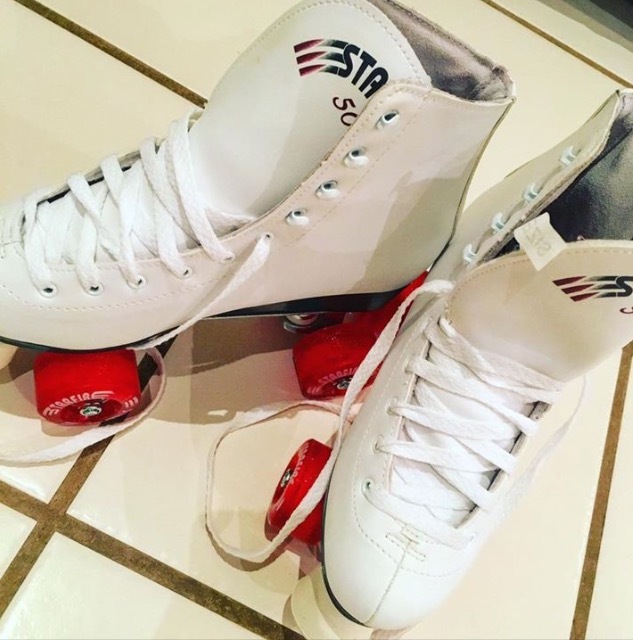 When I was eight years old I got my first pair of roller-skates. I woke up on Christmas morning with anticipation that shimmered in front of me like the gauzy curtain of a boudoir. I ripped it aside with nary a thought of how it may have been thoughtfully placed to create a mood, such was my desire and my need. I ran to the box that was the size and the shape and the heft of the things I had been wishing for since at least November, which of course was the same as forty-seven years in my eight year old chronoestimation. I held the box in my hands and waited a century-second before hungrily tearing off the slippery-gaudy-cheap paper. Skates. At last. Skates. My heart stopped beating for a moment-year, and I buried my face in the remnants of that gaudy paper, ashamedly scratching away the look of horror, before my parents could see what the face of an ungrateful child looked like. The skates were white, yes. The wheels were red, yes. They were boots, yes. But they were Hang Ten. I wanted Redstones. More than wanted: I needed Redstones. In that moment of complete and total disappointment, I knew that there was nothing I could do, and that I would never have Redstone skates. The part of my forebrain that somehow knew things that adults knew, was aware that this was probably my one shot. My one chance at owning Redstone roller-skates. And now it was gone. So close / so far. I forced a smile to my mouth and to my eyes, and carefully laced the hideous wrong-skates. My parents were overfrothing with the happy that comes from seeing their child truly love the carefully-chosen gift so much, that they can’t even speak. I couldn’t speak. To keep my hands from shaking and my from eyes crying, I began the soothing task of lacing, and once done, I slowly made my way down the slick cement front steps. Each step was heavy with the despair of the wrong-skates. I took a deep breath, bent my knees slightly to get my centre of gravity just so, and pushed off down our driveway. The skates rolled forward like nothing I’d ever felt before. They had a power of their own. I barely needed to push- I was gliding, gliding, flying, gliding. I skate-flew out onto the road, and lifted up to the touch the lowest lying clouds with the three lateral fingers of my left hand. From my place above the world I looked back to see my Mum and Dad below: she leaning into the space at the front of his chest where she fitted like a nesting cup, he with a grin that threatened to split his head open like the watermelon on that weird knife ad. I didn’t exactly know what that meant, but that day I knew without a doubt what considered, quiet, caring, love meant. It meant Hang Ten skates. The very best kind of love. Love that makes you fly. *This was created from a prompt from Liz Gilbert’s creativity challenge: What did you most love to do when you were eight? It was supposed to take 20mins. I failed- this took me 37minutes. Oh well. Close, as they say, but no cigar. What did YOU love to do when you were eight years old? Do you still do it? I mean that- why the hell not? Sometimes the beauty is in the spaces, isn’t it? The pause between when you tell him you love him for the very first time, and you wait, one beat, another, and there is that delicious-scary anticipation, before you hear what he will say back. The gap between the notes in your favourite song. You know precisely how long to hold the silence. You take your breath, before the lyric unfurls the next layer of story. The very first moment when you become aware of yourself in the morning, when for a second or two you are no-one and nowhere, your brain is furry and unfocussed, and there is no cancer or death or pain that cannot be taken away. The beauty of the space. This week two more of my people died. I know this is inevitable. That with every moment that passes, every beautiful space that passes me by, I draw closer to another death. A bigger space. Another one that can never be filled. Those deaths take my breath away, every single time. This week two more of my people died, and there is a space in my heart that can’t be filled, and nor would I want it to be. What do you say when someone dies? Do you say: passed away, passed over, left this earth, deceased? I don’t like any of those. I say they have left a space. And so I mark it. In my appointment book, which is the thing that runs my days, I write their name, where the time for their check up would normally be. My Dad comes in most Saturday afternoons. Hayley comes in every second Tuesday night. Geoff comes in once a month on a Saturday morning, and Bob has 9.15am on a Tuesday, every fourth week. Don’t worry about my tenuous grip on reality, I know they aren’t actually coming in, but I can’t bear to erase them, to take away the space they held in my life. In the beginning, the space is almost unbearable. The allotted time stretches out from my toes to eternity, and I think I will never endure the tock-tock-tocking of the moments passing. After the passing of months, that if joined together would wrap around the equator eleventy-million times, the space takes on a new form. The time morphs and passes faster, or perhaps it just has less barbs to be ripped out of the gentle skin of my forearms. The space holds itself, it never de-ceases, but I find that I have a fortitude, a fort, that I never knew I’d built, and I can sit in the space, and put the jigsaw pieces of my heart back together. Some of the pieces are missing. There are spaces where there once was a picture. But there is beauty in the parts that are now missing. They are the memories of my very own. Invisible to another, but clear to me.